Do you follow up with your prospects? Did you know that it could take up to 5 or more exposures to your offer before a prospect will finally make a purchase form you? What happens to all of the ones who only see it once? Are they slipping away or worse yet, going to your competitors and spending their money! You would be amazed by the number of marketers who are missing out on 60% or more of their sales, simply because they have no follow up system in place. But just any old system won't work. You need to have one that will help you build a relationship with your prospect. Why, because not only does it take exposure to make a sale, it takes trust and credibility. That is where having your own newsletter comes in. Let's go over some of the things having your own newsletter can do for your business. I could go on, but I think you get the idea. We all know how important it is to build a list of contacts. We also know how much time it takes to follow up with them on a regular schedule. That is why so many of us don't do it. It takes hours of researching and writing. It gets tedious and boring week after week and pretty soon we skip an issue or two, then the next thing we know it's been a month since the last issue. There goes all that credibility and trust right out the window. Your newsletter will go out each and every week to your list of home business seekers full of articles tips and product recommendations that are fully customizable with your name, email, website and Clickbank ID. But that's not the best part. You will get the private label rights to the newsletter. That means it is all yours to send out as is. You are the author. You may edit it, change it or rearrange it. You can even break it up into smaller ecourses, post on your website or blog for extra content. It's all up to you. You're in control. With all the basic grunt work done for you the possibilities are endless. You can add your own style and flair. With a little bit of creativity you could even use the content inside to create more newsletters for different sites or even rewrite the articles to submit to directories. Plus you can easily plug in and promote your own products and services. That's the beauty if private label rights. The content is all yours to use it however you want to! I've made customizing your newsletters super easy. All you need to do is use the search feature in your favorite text editor to find the simple phrases I have inserted in the messages and replace them with your own information. It's so EASY my seven-year-old daughter can do it!!!! more than 15 minutes customize your messages. With a few clicks of your mouse all 52 issues of your newsletter including the subject lines will be ready to load into your Auto Responder and start sending. So tell me how many hours of your valuable time with that save you? With the Home Business Niche Newsletter Set, you get everything you need to build a huge list and follow up with them on a weekly basis for a full 52 weeks with very little effort on your part. The "Home Business Newsletter set" package comes with 100% Master Resale Rights! You sell the package and keep ALL the cash. If you are not completely satisfied with the Home Business Newsletter set, all you have to do it ask and your money will be refunded! Just think.... You could have whole years worth of your own Home Business News Letter in a matter of minutes. You can customize it, plug it into your auto responder and forget it for a whole year. It's that easy! 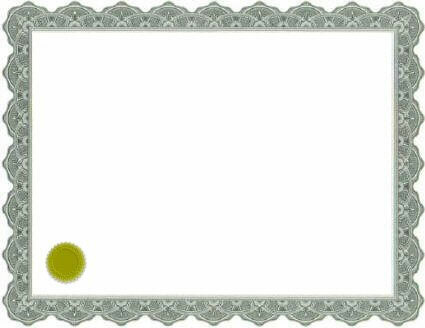 P.S Just think.... You could have whole years worth of your own Home Business News Letter in a matter of minutes. 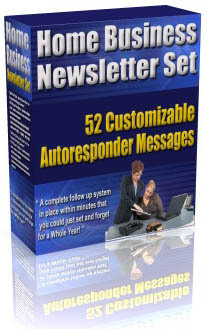 You can customize it, plug it into your auto responder and forget it for a whole year. It's that easy! Get this package right now and save time and money.